lifetime of pages: Warm and Fuzzy Baby Project with Leaky Shed Studios! Warm and Fuzzy Baby Project with Leaky Shed Studios! Hello! Hope the weather isn't too crazy in your neck of the woods. Living in New England, we are buried with over 3 feet of snow! Today's project is a burlap canvas embellished with all things warm,soft and fuzzy. The sweet baby is my dear friend's daughter. I love her "fierce" pose! She is the baby sister to 2 older brothers so bring on the pink! The burlap canvas is 12" by 12" and layered with a large crocheted doily and a strip of pink burlap. I wanted to keep the feel of the project as soft and cozy, just like Maddy snug in her baby blanket. 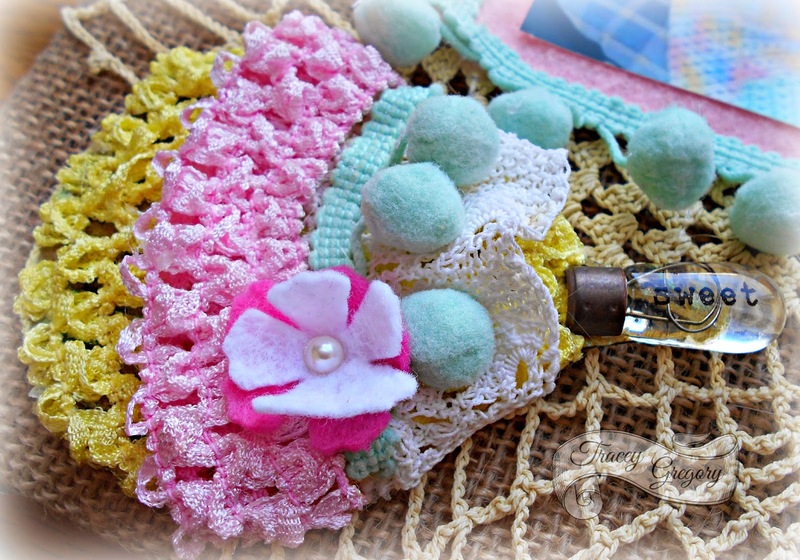 Using the Leaky Shed Studio Hot Air Balloon chippie, I colored it in with yellow gelato then layered pieces of stretchy baby headbands,lace and some soft pompom trim. I added a "sweet" light bulb embellishment from Prima as a basket. The final touch was adding a small felt flower. 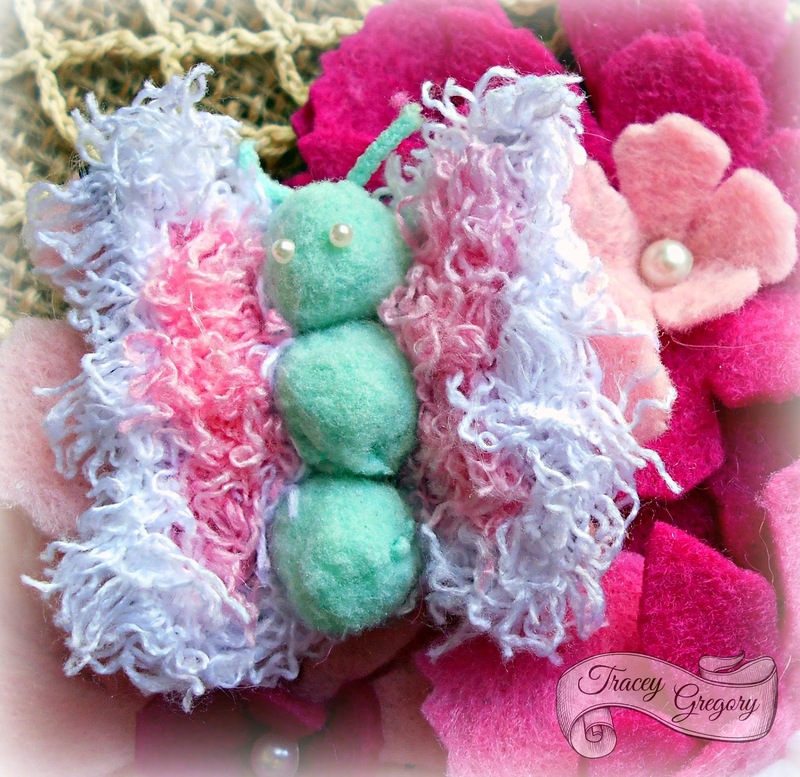 Keeping with the soft and fuzzy theme, I altered the Spring Small Butterfly chipboard. I first glued some pink felt petals to the back of the gessoed chippie. 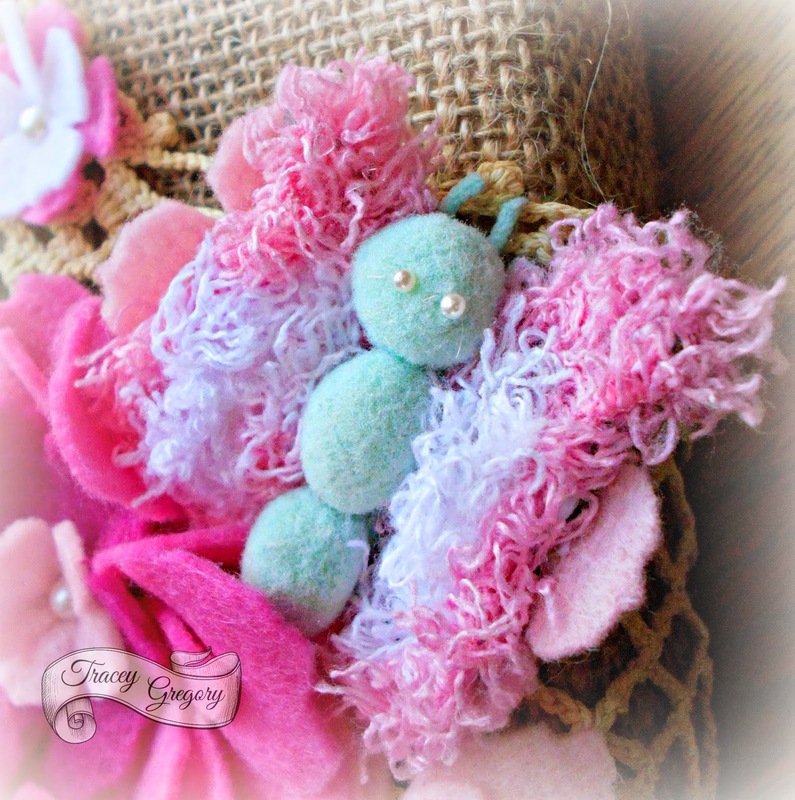 Using baby yarn, I layered in the fluffy wings. The body was created with 3 cut pompoms-I left the strings on the head for antennas. Add 2 sweet pearly eyes and you have a set of adorable butterflies. Because the chipboard is so sturdy it holds it's shape no matter how much paint, material or glue you add. 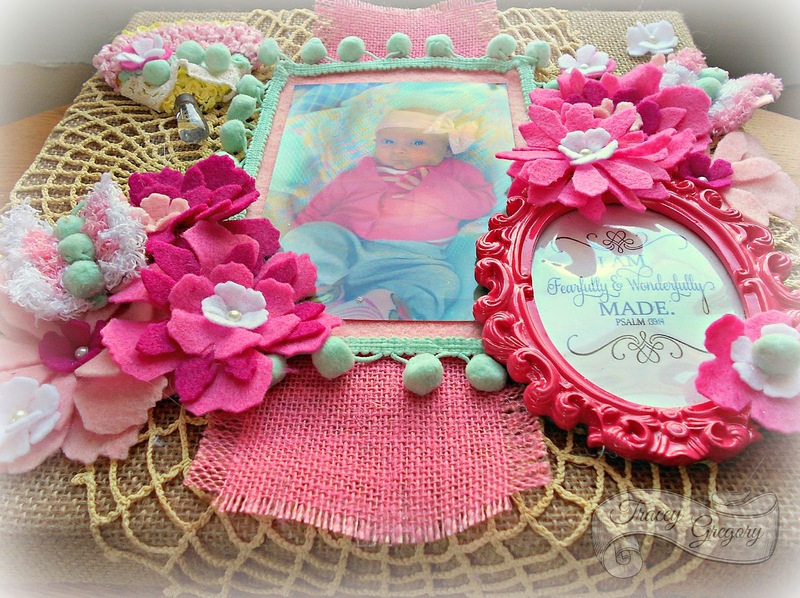 All my felt flowers were created with the Tim Holtz Tattered Floral die and layered. The pink ceramic frame was from the dollar aisle at Michael's and just the right size to balance the hot air balloon chippie. As you can see, there is lots of depth and soft texture to this project. I hope my friend likes it! 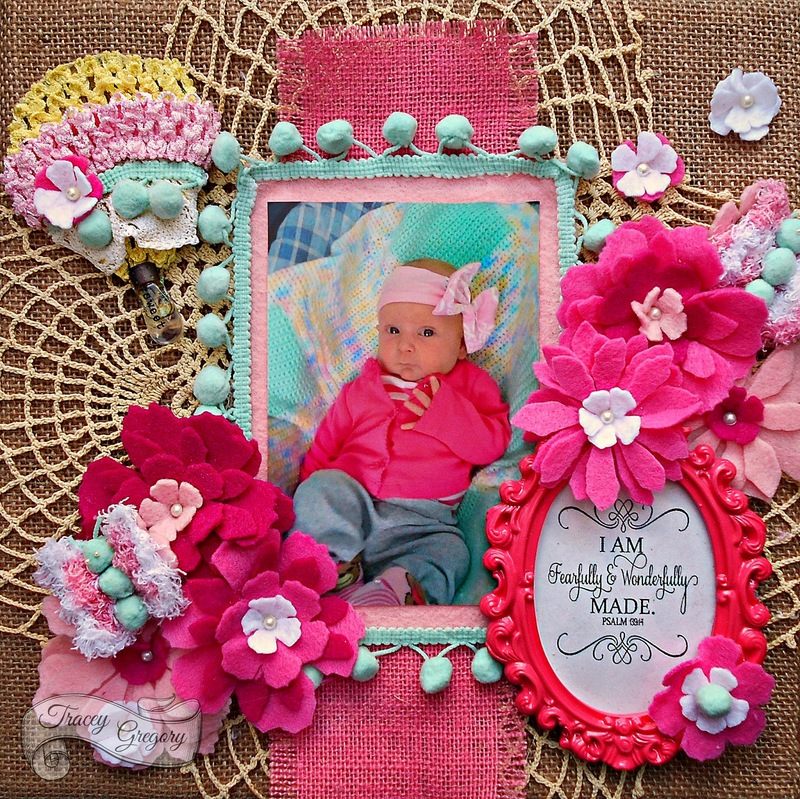 Don't be afraid to load up materials on these chippies and have some fun with your scraps!